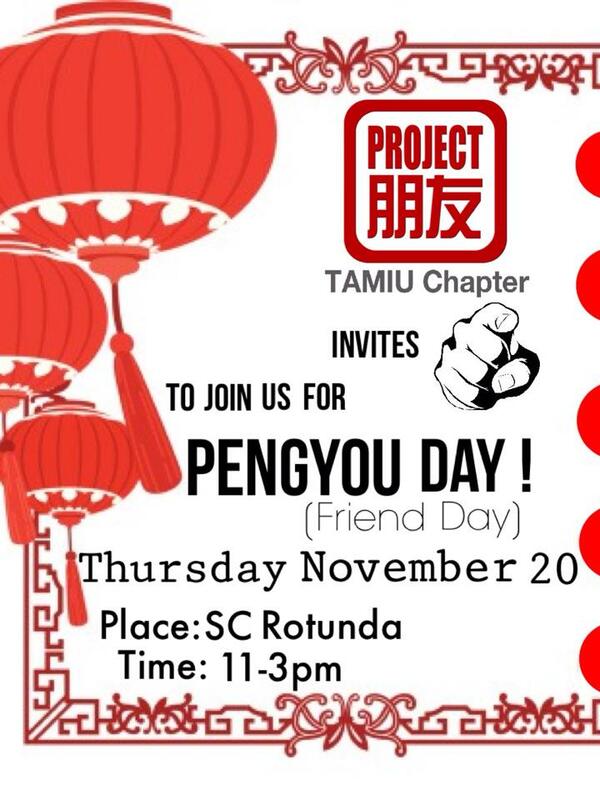 Project Pengyou TAMIU Chapter invites you to be part of Pengyou Day! 朋友 is the Chinese word for Friend or Friendship. Pengyou Day is a celebration of Friendship and better relations between U.S. and China! November 20th, during International Education Week, Project Pengyou TAMIU chapter will be hosting an interactive information table along with a Cultural awareness table representing China. Join us to learn more about China, learn some Chinese catch phrases, get your picture taken in our interactive Pengyou Photo booth, drink some Chinese tea with us and find out about all the different opportunities to study and work in China. Let’s carry on and Pengyou ON!